Homeowners looking for an easy, versatile, and attractive way to include an entry area designed specifically for transitioning from life outside of the home to life inside will enjoy these mudroom plans. Mudrooms are an architectural space in the home that are first seen when entering and are typically shared with a laundry room or pantry. These rooms are a great place for people to take off their coats and hats and set down their bags and keys before settling into their homes. These homes include a variety of designs and features to help transition guests and homeowners comfortably into indoor relaxing. 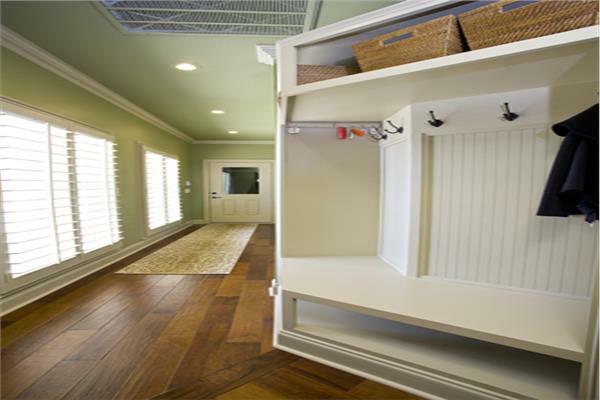 Some homeowners also choose to add a mud Room that also incorporates laundry facilities. This can be a helpful and convenient decision for homeowners who want to maximize space usage in their home plans. Regardless of whether homeowners choose to use these mudroom plans for both home-entry transition or laundry utility, the amount of floor space dedicated to this area is entirely up to them. Some homeowners choose to dedicate a space-efficient 50 square feet, while others choose to dedicate a more luxuriously-sized 200 square feet of the floor plan. Choose from plans that include features for clothing storage, laundry room utilities, and more. For homeowners who want to use mudrooms as a laundry facility, choose from features such as a washer and dryer, sink, folding counter, foldable ironing board, and cleaning closet. For homeowners who want to use mudrooms as entryway transitioning, you can choose from designs that include single or multiple outerwear lockers, knick-knack cubbies, a message and communication center (like a cork board or chalkboard), overhead cabinets for additional storage, a bench to take of shoes, and much more. This space is great for families to store their belongings in their own baskets or drawers for easy access when leaving the home.